Chilly days call for big pots of chili to warm you from the inside out- and that's just what I cooked this weekend. I was in the mood for something a little different from the usual tomato-based red chili, so I tried a white chili instead, inspired by this recipe from The Kitchn. White chilis generally have green chiles, white beans like Great Northern or cannellini or navy beans and chicken or turkey- which for a vegetarian version can be simply omitted or subbed with some mock meat. This time I used quorn (mycoprotein) mock chicken tenders- stocked up on sale at the grocery store. Here's my version of the recipe, in brief. It is an easy peasy recipe and it was an instant hit. I'll be making this hearty chili again and again. Canned green chiles and white beans (both the dry and canned versions) are easy to find in any US supermarket. For the corn, I used frozen roasted corn from Trader Joe's- I thawed it before using it in the recipe. But any fresh, canned or frozen corn would work. Soak 3/4 cup of dried white beans overnight. Rinse and pressure cook them. Set aside. Heat 2 tbsp. olive oil in a large pot. Saute 1 diced onion, 1 diced green pepper, 1 diced carrot, 1 diced yellow squash and 3 cloves of garlic, minced. Add a can of diced green chiles, cumin, oregano, Mexican chili powder, salt and pepper to taste. Saute for a couple of minutes. Add 1 cup corn, 1 packed mock chicken (I used quorn "chicken" tenders), white beans and 6 cups vegetable stock or water. Bring to a boil and simmer for 20 minutes. Meanwhile, in a separate saucepan, melt 3 tbsp. butter. Add 3 tbsp. flour and whisk to make a roux. Add 3/4 cup whole milk and whisk well to make a thick lump-free sauce. Add the white sauce into the soup and mix well. Simmer for 10 more minutes. Turn off the heat and garnish with juice of 1/2 lemon and a handful of minced cilantro. Taste and adjust salt and seasonings. Serve with hot sauce on the side, plus a topping of crushed tortilla chips and shredded cheese, if desired. As the original recipe says, the flavor and texture of the soup gets better a few hours after it is made. If you're looking for a hearty stew this winter, I highly recommend this recipe. Half-way through January, I'm pretty excited about how this month is coming along. The goal for this month was to start cutting down on excess carbohydrates to make my diet more compatible with my body's challenges with managing blood sugars. The way I am eating now does not feel all that different from the way I ate before. There are only a few tweaks in place to reduce or replace the big carb heavy components. So I have been eating dal and subzi, just with a big pile of koshimbir (shredded raw vegetables) instead of rice. I enjoy Mexican flavors, but in a bowl instead of rolled up in a tortilla. I've been trying out spaghetti squash casseroles and loving them. I've been making a dressing for Caesar salad that is so irresistible that it has me craving big bowls of greens. And so the emphasis is on satisfying vegetable-heavy meals. This is important because what I'm trying to establish here is not a "diet" in the sense of that short-term unpleasant thing you do to get to some goal. This is the way I will eat for the rest of my life. As for ingredients like rice, it is not an all or nothing deal. Every now and then, I will eat a small amount. For instance, I made my favorite quick winter meal- khichdi- with 1 cup moong dal and 1/4 cup rice. Usually there's at least as much rice as dal, if not more rice than dal. And I enjoyed my dal-heavy khichdi with a large helping of two different stir-fried vegetables- subzis, making vegetables the star of the meal while also enjoying the warm khichdi. What about snacks? Crispy salty snacks are my kryptonite. This month, I've completely stopped buying potato chips, tortilla chips and fried Indian snacks like chaklis. If I am served any of these things somewhere, say at a party or a friend's home, I'll eat a few- no problem. But I just can't have the whole package in my house because I know I simply cannot eat these in moderation- the family size bag will vanish in hours. When V picked up a packet of chaklis at the store, I requested that he keep it in his office for snacking instead of at home. Because I don't need a packet of chaklis in my pantry and also, once I get my hands on it, he has no chance of tasting even half a chakli. I'll polish them off in record time. So you do need family buy-in to help you avoid the foods you're trying to steer clear of. Instead, this month I'm keeping three snacks on hand, all three are foods that I love: (a) nuts, (b) hummus and veggie sticks and (c) homemade granola with unsweetened almond milk. If cravings strike between meals, I turn to one of these. Many people use high-protein granola bars and smoothies as snacks, but I really don't like the taste of either granola bars or smoothies, so I'm going with what I personally like to eat. But here's the funny thing: I rarely feel like snacking any more. All my life, I've been on a roller coaster of high and low blood sugars. I get hunger pangs every couple of hours, and need regular snacks between meals to keep from feeling jittery and moody. Once I removed the thing that my body can't handle- excess carbs- the problem of being constantly hungry is going away too. For the first time in my life, I'm not craving snacks all the time and it is a nice feeling to be satisfied from one meal to the next. Let's see what the rest of this month brings. squash bakes sound prefect Nupur. When you find the time please do post a recipe or two. I'll try it first and then pass it on to mum. Am love how you are doing this in phases and thru that process are finding such interesting and and yet fulfilling recipes/dishes to eat. I agree totally on the roller coaster that your body goes on when it's trying to process excess sugar/carbs making you moody and irritable. You described my mum and all of her siblings in that one sentence:-) For years before their diabetes was detected we didn't know what made them that way and imagine on holidays when all of them ended up in one house!!! Not pretty. My mom has thru sensible eating for the past six months brought her medications down to almost nil. This year she looks fwd to and is hell bent on going off insulin totally. You know because you are the primary cook(am assuming here of course) in the home in the years to come everyone else in the family will benefit too from your new wisdom in the kitchen. We found that happened to us when my sister visited us couple years ago and we helped her get down from 80 kgs to a svelte 55 kgs, we had to help her change the way she thought about food, portion sizes and exercise(this last has always been her nemesis and now she runs marathons, imagine!). But after she left we'd all changed the way we thought about food, for the better, I must add. Deepa- I'll certainly post the squash bake recipe in the next week or two. I loved hearing the story of your sister, and how a couple of months can be life-transforming if you take the time to learn something new and change your attitude. And good luck to your mom- it sounds like she's doing great and is very motivated to make changes for the better. This recipe looks great - I'm on a soup kick lately (mostly because of fewer dishes to wash). I would love to try this out soon. "don't aim to cut out things from your diet but aim to crowd your diet with things that are good for you" I love that, Nisha! And yes, it is precisely what I seem to be doing these days. Last night, we had a friend over for dinner and I made egg curry, raita, cabbage stir-fry and rice. By the time I served myself the first three, I had literally no place on my plate for the rice. So that's been my strategy, anyway. It is great that you're identifying what your triggers are. That's the most important thing, then you can think of ways to change them. Knitting while watching TV has certainly worked for me! Kudos to your dedication! I wish I were as dedicated as you. Could you please write a little about carb requirements and carb counting. I cannot imagine myself eating meals without rice or rotis. I'm 100% sure that I'm eating more carbs than the daily requirement but have no idea how to find out how much I'm eating. Loving this series! There's no dedication required, Amruta. Just a simple desire to change and a bit of planning in baby steps. Don't fall into the trap of thinking that this requires some great level of dedication- that will keep you from making a start. Carb counting is pretty straightforward. (1) Write down everything you eat over the course of a day. Every meal, every snack. Write down the food and how much of it you ate. You might need to measure things like cereal and rice, because estimates can be wildly off. We think this is a 1/3 cup of rice but when you put it in a measuring cup, it is closer to 3/4 and that sort of thing. (2) For each food, look up the carb content. This is listed on nutrition labels for packaged foods. For other things, you might have to do a web search. Carb contents are easy to find. (3) You are looking for net carbs, which is total carbs minus the fiber carbs. Eg. if you ate one tortilla and the nutrition label on the package says it is 20 grams of total carbohydrate and 4 grams of dietary fiber, then your net carbs would be 20-4=16 grams carbs for that tortilla. You have to note down carbs for the whole day's worth of food and add them up. E-mail me if you'd like more info! I chuckled when you wrote about your kryptonite. Mine is cheese curls/puffs and CooKies. I can eat cheese curls until the inside of my mouth is raw and my fingers are stained orange. And CooKies, sigh, it doesn't matter; they are all good. Raw, baked it doesn't matter, CooKies, sigh. Judy- It is good to identify one's kryptonite because then you can do something about it! Sounds like you are doing great, and this chili sounds wonderful! I am the same way with salty snacks; just cannot buy them! Thanks, Kalyn. Yes, I think that one step (not buying them) will save me considerable willpower, and $$ as well! Wow Nupur, you're doing great. I'm really not as dedicated as you, so I guess the weight loss will take much longer. Cheetos, chivda, funyuns, batata wafers and all its extended family are my kryptonite. I can eat massive quantities of these. Would love to get my hands on your salad dressing recipe, if you can post that please. Dear Anon- Please repeat after me, "This does not need any dedication, just a simple desire to change". Please don't defeat yourself before you even begin! Snacks are nice, but when the snacks control you instead of you controlling them, it is time to kick that habit, right? In my case, the thing I did was not buy the snacks. How can you eat massive quantities of something that isn't there? Doesn't require much dedication. I'll post the salad dressing recipe for sure! I was eagerly waiting for your new post to know how you are doing, Nupur. This comment is going to be super long since I have so much to share with you so I apologize in advance. I love hearty chilis but I've never tried a white chili yet, I should give it a try. Kudos to you on not keeping the chakalis at home. That is the only foolproof way to avoid eating them. I get the dry roasted shell-on chickpeas flavored with turmeric as a snack from the Indian grocery store and occasionally the roasted peanuts from Baruch. I am also doing great so far. I really enjoy going to the zumba class, it is so much fun. On days I don't have a class I work out at the gym. Over the weekend I cooked and froze some healthy meals we love as a backup option for days when I might get late or am too tired to cook which always results in us eating out and skipping work out, so this should take care of that. I love snacking on apples, pomegranates and edamame. I am eating a whole lots of vegetables in all forms - practically in every single meal and pairing it with my favorite protein sources - eggs, beans, lentils, dairy and occasionally soya chunks. I still make rotis/chapatis since I just love making them but I add ground flaxseed and wheat bran to my rotis. We regularly make khichadis with brown rice that have more dals than rice for dinners, I like to add chopped yams, sweet potatoes or leafy greens to my khichadis. I hope I can stick to this lifestyle for as long as I live. I feel so good already. My next goal is to kick the caffeine habit since I can't have it without sugar and I am caffeine-sensitive too, I have realized that if I get enough sleep I don't need caffeine to feel awake/ alert. I used to not consume caffeine regularly few years back so I know it does me so good. I want to have it as an occasional treat just as I used to. Wish me luck! You're having a great month, Priti! Thanks for the snack ideas. It is nice when you end up feeling good which in turn motivates you to keep going. Good luck with kicking the caffeine habit! I never understood the snack habit. Growing up in Mumbai, we didn't snack much as kids. Of course, there would be fruits, maybe a homemade snack (sometimes). But candy would be a rare treat, so also potato chips/wafers, etc. Ayurveda likens our digestive energy to a fire. When we eat a full, satisfying meal (lunch can be the biggest because that's when the digestion is the most powerful), that fire burns bright and powerful. The fuel is perfect, and it feeds the fire well. In turn, the fire burns the food down, resulting in perfect digestion, absorption and assimilation of nutrients. Eating snacks through the day, I think, does not allow the fire to grow in strength and intensity. Thus it starts to lose its potency, and its ability to function well. That being said, I have my evening tea + 1 khakra/biscuit/chivda snack with a semi-religious fervor. :) But I am almost militant with my snack portion control. If I were to go overboard, then dinner would be affected (since my hunger is kinda satisfied), leading to sleep delay, poor sleep... and then waking up in the morning feeling out-of-sorts. Lakshmi- you are able to be militant with your snack portion control but some others like me struggle with it. I believe it is not so much about willpower or greed, but a matter of body chemistry and hunger hormones. Oh, I am sorry if I came across as being pompous or a know-it-all. I only meant to share my experience. I don't think this conversation is either about willpower or greed but it is certainly about understanding our individual cravings and how we can work best with them. Lakshmi, I agree that ayurveda likens our digestive energy to a fire, to be more precise like a 'hawan-kund' and so do the sanskrit shlokas that are chanted before meals. If you have witnessed a hawan kund it is fed little-by-little after some duration with fuel to keep the fire alive and stable, if everything is poured in big quantities only 2 or 3 times then it will disturb it and do it more harm than good, similarly it may cause acidity in some and drop of blood sugar in others. Hence, snacking is not bad or harmful if the snacks are healthy and in small portions instead of eating heavy meals 3 times a day. I agree that our digestive fires are at a peak during the day time than at night, since we are more active during the day and rest at night so a light dinner makes total sense but so does a good wholesome breakfast. Snacking was consider very bad during my childhood but that led to over-eating during meals, stuffing ourselves so that we are not hungry until the next one. Now as an adult running my own household I have come to realize that snacking need not be bad, I don't have to make it complicated and it helps me not feel starved at mealtimes to overeat since I would have had eaten something a couple of hours before and will have my next snack a couple of hours later. Seasonal fruits and berries, nuts, some raw vegetables, yogurt and even boiled legumes are all great snacks that keep the digestive fires going - a small meal at a time that will offer a wider variety of nutrition. Courtesy: Rujuta Diwekar's books on nutrition, weight loss and workout. I am so proud of you nupur for sticking with your plan! Feeling healthy is a really nice feeling, and once you get used to it, bouncing back from an occasional bad-eating spell is very easy. Good for you that your babe is sleeping better! That makes a huge difference. Even today with my 3+ yr old, we are not guaranteed uninterrupted sleep and that's definitely a challenge. thanks for the recipe. I will definitely make it. This week I made a huge batch of spanish chickpea soup- chick pea, red potato, carrots, celery, bay leaf, oregano, paprika, garlic, leeks, and chicken and ham (could be substituted). I made mine in my slow cooker and its very good. Good for you for coming up with a plan and sticking to it.Sure you will reap benefits. Im doing well with my food too in the New Year. I'm trying to avoid wheat as much as possible too.Currently Im enjoying a rice cake with peanut butter and a few slices of banana drizzled lightly with honey for breakfast, hearty soups for lunch (sometimes with rice crackers or a slice of my homemade gluten free bread) with a small piece of cheese, and small portions of rice with subzi , deal and curry. For snacking really enjoying honey crisp apple with peanut butter at the moment., a handful of peanuts etc. for dessert I sometimes drink herbal unsweetened tea with a small square of dark chocolate. its nice to experiment and find ways to indulge healthily. I appreciate food more nowadays I feel. When I do eat unhealthy food nowadays I recognize it as a one time rare event , enjoy it and am happy to move back to my healthy eating. I love your snack ideas, Arpita! And like you, I'm finding that I appreciate food more. The good nutritious stuff that I'm choosing, and the other "fun foods" that I get to enjoy once in a while. Dear Nupur, Thank you so much for the amazing posts. I am in my mid 30's and have been a pre-diabetic for last 10 years.I used to take 2000 mg of Glucophage per day last 6 years. I took this challenge of diet control, exercise and requested the doctor to reduce the medication by half. However 2 months into dose reduction, I feel I have lost this battle. I eat salads for lunch. Dinner is 2 small chapatis with lot of sabzi. I exercise for 20 minutes after dinner and go to bed 3 hours after the meal. However my fasting blood sugar is never below 99. On an average I exercise for about 40 minutes per day. I maintain a healthy BMI. I am not sure what I am doing wrong but have been very disappointed. Thanks so much for raising awareness of this disease. Your recipes and food habit changes are very inspiring. Dear Anon- I have 2 things to say to you. One, about medication. You're not losing the battle if you need medication. If you're working on your diet and exercise and need medication to supplement your efforts, that's not a bad thing. The drugs are there to help. By the way, glucophage (metformin) is very safe and effective for increasing insulin sensitivity. It does not burn out the pancreas. Not a bad drug to be on, at all, for someone in your situation! Please don't be disappointed. There is much to read, much to learn, much to try. You have my very best wishes! Thank you for this series. I am learning a lot and hope to incorporate it into my lifestyle. I have always been a thoughtful cook and made mostly healthy meals with lots of veges and greens. Mostly because that is how my mom cooked. This style of cooking is very time consuming and I would tease my mom that she spent a significant portion of her life prepping vegetables for our meals. I have always admired her for being so conscious of what we ate 30 plus years ago. She would give us moong sprouts to eat the first thing in the morning every single day from when I could remember till I left for college. Amazing, as she is in her late sixties now and she did not even go to college. But over the last few years I have had some health challenges of my own, that I cannot control with lifestyle. The frustration and the lack of time and energy has made me slowly loose interest in cooking and now I don't eat as healthy as I used to. It is hard to eat healthy if you don't plan, or put in the time and effort...and that is where I am now! Hence your series has been so motivating for me!! Please keep writing and sharing your great recipes. SN: I also spend considerable time prepping veggies and lately I'm spending even more time on this! All worth it, though. Your wise mom certainly has her priorities straight. It is true that one needs to invest time and mental energy in planning meals. I'm sorry about your health challenges and hope things look up for you! Good nourishing food certainly helps in all cases. Thank you so much for sharing information about your journey towards healthier lifestyle. I am an avid follower of your blog posts. Keep going. My best wishes to you. Thank you, Sushma, for this nice note! 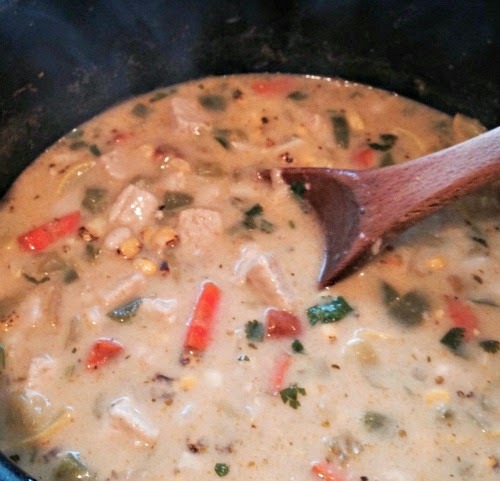 I was thinking of making white chili for the coming weekend and here you have the recipe already :-) We are expecting a 6+" snow storm on Saturday, our first big one for the season. Good to hear that you are doing good with the low-carb, high-veggie diet. My goal was to start exercising and I've been good so far. My husband & I started working out with P90X videos. I am slowing getting over the initial aches and pains associated with exercising and getting used to the routine. Hope to keep the momentum going. How's it going with the big snowstorm? Hope you are all staying safe and warm!! I wonder if GA will get any "snow" this year. A year ago, we got an inch and it paralyzed life for a week. P90X- good for you! I tried it a few years ago but quickly gave up. But it is intense and a great workout. Kashi aahes? loved all your posts about diabetes including the book review. gharti ek jan tari sugar problem aslela milto. the kushi institute. Michio kushi who was the founder of kushi insititute and played a big role in spreading of macrobiotics in US passed away recently. It is a food life style which the Buddhist monks followed in japan. Hi Vinita, Thanks for your note! Yes, I've heard of macrobiotics and the main reason it wouldn't work for me is that it is a heavily grain-based diet. With my insulin resistance, I can handle only small amounts of grains (they are mostly carbs). The thing that bothers me about macrobiotics is that they make cancer-fighting claims that are not proven. Anyway, there are a zillion diets out there. i am so happy that you found a plan that makes you feel good and healthy. wishing you the best. I'm sorry the comment was lost :( That seems to happen sometimes for mysterious reasons. Thanks for the sweet wishes!